A touch of green: Climate change: Is more news good news? 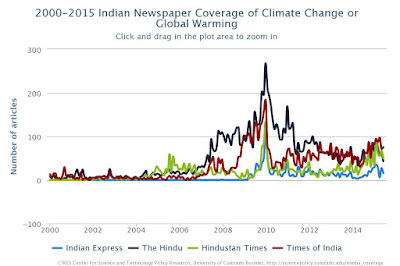 The Indian media has been reporting on climate change far more frequently in the past months. As the international community prepares for the end-2015 Paris Conference of Parties (CoP) to the Climate Change Convention – which will decide on the successor to the Kyoto Protocol – there have been far more stories mentioning climate change and global warming in the Indian media. Does this signify a coming of age for climate change reporting in the country, or is this a flash-in-the-pan interest that will not continue after the Paris CoP? This question emanates from the trend for India in the continuous assessment graphs being plotted by the Center for Science and Technology Policy Research at the University of Colorado at Boulder, USA. 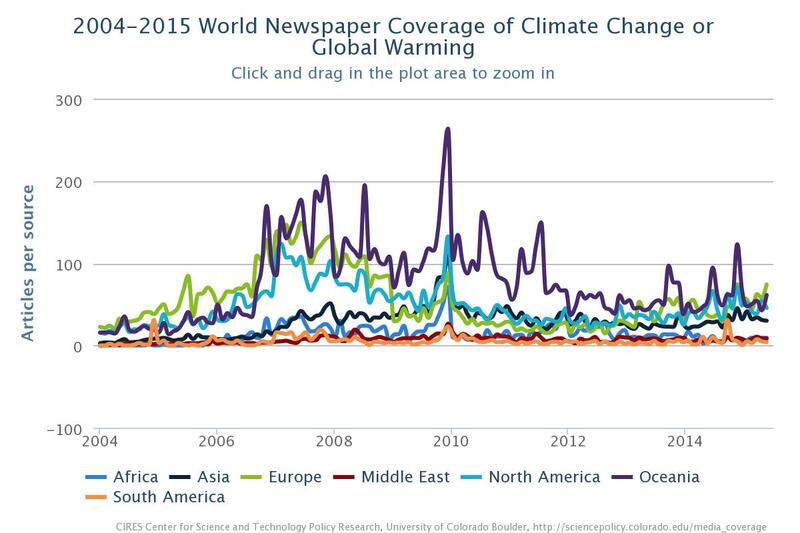 The CSTPR graphs track 50 newspapers across the world using the keywords ‘climate change’ and ‘global warming’. The global list includes four newspapers from India – the Hindu, the Times of India, Hindustan Times and the Indian Express. Like with media across the world, Indian media’s interest in the subject peaked around the December 2009 Copenhagen CoP, where the world hoped for an international political solution to the climate change issue. However, that was not to be, and the media attention never peaked as much as with the Copenhagen CoP later. The only periods when the attention peaked was during and immediately before and after the annual CoPs, which were held near the end of the every year. India follows this global pattern. However, there has been a consistent increase in media coverage in India since the beginning of 2012, from where there has been a near-consistent plateau in the CSTPR graph. Though this does mirror the global trend, there are far less peaks and troughs in the Indian graph. Absence of peaks and troughs signify consistent day-to-day reporting, which means that there is a potentially higher issue recall among readers. This in turn means that there is potential for greater public pressure on policy makers to support greenhouse gas mitigation and climate change adaptation. The CSTPR graph is just the tip of the Indian media iceberg, but it gives an indication of the trend. According to the Indian Readership Survey for fourth quarter of 2012 (the figures since 2013 have been disputed by the media industry), the Times of India, Hindustan Times and the Hindu are the top three most widely read English newspapers, with a combined readership of 13.5 million. The Indian Express added another 0.5 million. The figures of the English newspapers, however, pale in comparison to the readership of the Hindi dailies, whose readership has grown manifold in the past 15 years. The most read Dainik Jagran itself had a readership of 16.5 million during Q4 of 2012. In spite of their lesser readership when compared to the Hindi newspapers, the four English dailies tracked by the CSTPR study have the potential of reaching a strong section of the readership in India and also parliamentarians and other decision makers. Thus, if the increased reporting in these four newspapers reflects the thinking of the people who read them, then there is an increased attention on climate change in this section of the population. Even if it the other way around, i.e., these newspapers are driving the interest among the readers, it is a good indication that there is a greater discussion on climate change. The CSTPR graphs show that in the build up to the Paris CoP, media attention on climate change has been increasing in most of the countries. In the USA, though the graph is still jagged the peaks of media stories, especially those contributed by the New York Times, have been high. The graph for the UK is both similar and dissimilar to the one for the USA. The British media seems to have reported more frequently about climate change than its American counterparts. However, like in the USA there is one leader among the pack in the UK too. Since September 2014, the Guardian and Observer have been doing far more stories on climate change than any other media outlet in the world. In November 2014, the month before the Lima CoP, there were 446 stories in the Guardian and Observer. Media in Australia and Canada continue to have periods of interest and disinterest. In the number of news stories on climate change published in a month, the Australian media scores much higher than the Canadian media. 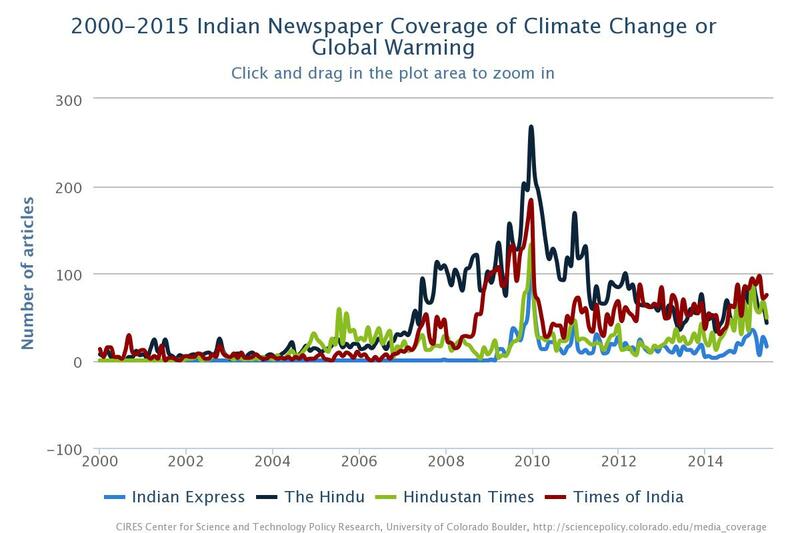 As the CSTPR graph for India shows, the Indian media has had a weaker coverage on climate change before 2005, even though New Delhi hosted the CoP in 2002. This is despite the fact that India has been an active participant in the climate change negotiations since the 1992 United Nations Conference on Environment and Development (the Rio Earth Summit). Interestingly though, the Indian negotiating position has not changed much from the “we are against binding emission reduction targets” in the past 23 years. In Paris, India will need to show its commitment to emission reduction, even while keeping its space for economic growth. This is where a steady flow of stories on climate change will help make the discussions in the country more comprehensive, and possibly also pressure the negotiators to have a more nuanced than a rhetorical position. The developed country vis-à-vis the developing country binary position of the early 1990s is certainly passé for India, and when there are more stories in the media there is more scope for the multiple dimensions of the climate change discussions to be articulated in the public domain. Like with the Copenhagen CoP, an increased media attention on climate change in the build up, during and immediately after the Paris CoP can be expected in India. The likelihood of this momentum continuing is high, since the media has been steadily exploring how the climate change discussions link to the day-to-day lives of the readers, viewers and listeners. McAllister, L., Nacu-Schmidt, A., Wang, X., Andrews, K., Boykoff, M., Daly, M., Gifford, L., and Luedecke, G. (2015). World Newspaper Coverage of Climate Change or Global Warming, 2004-2015. Center for Science and Technology Policy Research, Cooperative Institute for Research in Environmental Sciences, University of Colorado, Web. [18 June 2015] http://sciencepolicy.colorado.edu/media_coverage.